This article is about cellular photoreceptors. For other types of photoreceptors, see Photoreceptor (disambiguation). A photoreceptor cell is a specialized type of neuron found in the retina that is capable of phototransduction. The great biological importance of photoreceptors is that they convert light (visible electromagnetic radiation) into signals that can stimulate biological processes. To be more specific, photoreceptor proteins in the cell absorb photons, triggering a change in the cell's membrane potential. There are currently three known types of photoreceptor cells in mammalian eyes: rods, cones, and photosensitive retinal ganglion cells. The two classic photoreceptor cells are rods and cones, each contributing information used by the visual system to form a representation of the visual world, sight. The rods are narrower than the cones and distributed differently across the retina, but the chemical process in each that supports phototransduction is similar. A third class of mammalian photoreceptor cell was discovered during the 1990s: the photosensitive ganglion cells. These cells do not contribute to sight directly, but are thought to support circadian rhythms and pupillary reflex. There are major functional differences between the rods and cones. Rods are extremely sensitive, and can be triggered by a single photon. At very low light levels, visual experience is based solely on the rod signal. 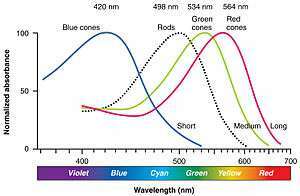 This explains why colors cannot be seen at low light levels: only one type of photoreceptor cell is active. Cones require significantly brighter light (i.e., a larger numbers of photons) in order to produce a signal. In humans, there are three different types of cone cell, distinguished by their pattern of response to different wavelengths of light. Color experience is calculated from these three distinct signals, perhaps via an opponent process. The three types of cone cell respond (roughly) to light of short, medium, and long wavelengths. Note that, due to the principle of univariance, the firing of the cell depends upon only the number of photons absorbed. The different responses of the three types of cone cells are determined by the likelihoods that their respective photoreceptor proteins will absorb photons of different wavelengths. So, for example, an L cone cell contains a photoreceptor protein that more readily absorbs long wavelengths of light (i.e., more "red"). Light of a shorter wavelength can also produce the same response, but it must be much brighter to do so. The human retina contains about 120 million rod cells and 6 million cone cells. The number and ratio of rods to cones varies among species, dependent on whether an animal is primarily diurnal or nocturnal. Certain owls, such as the tawny owl, have a tremendous number of rods in their retinae. In addition, there are about 2.4 million to 3 million ganglion cells in the human visual system, 1 to 2% of them photosensitive. The axons of ganglion cells form the two optic nerves. The pineal and parapineal glands are photoreceptive in non-mammalian vertebrates, but not in mammals. Birds have photoactive cerebrospinal fluid (CSF)-contacting neurons within the paraventricular organ that respond to light in the absence of input from the eyes or neurotransmitters. Invertebrate photoreceptors in organisms such as insects and molluscs are different in both their morphological organization and their underlying biochemical pathways. Described here are human photoreceptors. Anatomy of cones and rods varies slightly. Rod and cone photoreceptors are found on the outermost layer of the retina; they both have the same basic structure. Closest to the visual field (and farthest from the brain) is the axon terminal, which releases a neurotransmitter called glutamate to bipolar cells. Farther back is the cell body, which contains the cell's organelles. Farther back still is the inner segment, a specialized part of the cell full of mitochondria. The chief function of the inner segment is to provide ATP (energy) for the sodium-potassium pump. Finally, closest to the brain (and farthest from the field of view) is the outer segment, the part of the photoreceptor that absorbs light. Outer segments are actually modified cilia that contain disks filled with opsin, the molecule that absorbs photons, as well as voltage-gated sodium channels. The membranous photoreceptor protein opsin contains a pigment molecule called retinal. In rod cells, these together are called rhodopsin. In cone cells, there are different types of opsins that combine with retinal to form pigments called photopsins. Three different classes of photopsins in the cones react to different ranges of light frequency, a differentiation that allows the visual system to calculate color. The function of the photoreceptor cell is to convert the light energy of the photon into a form of energy communicable to the nervous system and readily usable to the organism: This conversion is called signal transduction. The opsin found in the photosensitive ganglion cells of the retina that are involved in various reflexive responses of the brain and body to the presence of (day)light, such as the regulation of circadian rhythms, pupillary reflex and other non-visual responses to light, is called melanopsin. Atypical in vertebrates, melanopsin functionally resembles invertebrate opsins. In structure, it is an opsin, a retinylidene protein variety of G-protein-coupled receptor. When light activates the melanopsin signaling system, the melanopsin-containing ganglion cells discharge nerve impulses that are conducted through their axons to specific brain targets. These targets include the olivary pretectal nucleus (a center responsible for controlling the pupil of the eye), the LGN, and, through the retinohypothalamic tract (RHT), the suprachiasmatic nucleus of the hypothalamus (the master pacemaker of circadian rhythms). Melanopsin-containing ganglion cells are thought to influence these targets by releasing from their axon terminals the neurotransmitters glutamate and pituitary adenylate cyclase activating polypeptide (PACAP). The human retina has approximately 6 million cones and 120 million rods. Signals from the rods and cones converge on ganglion and bipolar cells for preprocessing before they are sent to the lateral geniculate nucleus. At the "center" of the retina (the point directly behind the lens) lies the fovea (or fovea centralis), which contains only cone cells; and is the region capable of producing the highest visual acuity or highest resolution. Across the rest of the retina, rods and cones are intermingled. 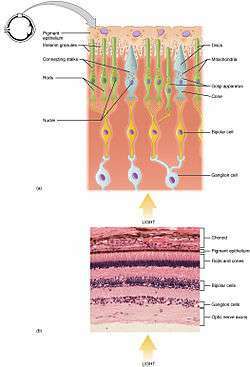 No photoreceptors are found at the blind spot, the area where ganglion cell fibers are collected into the optic nerve and leave the eye. The photoreceptor proteins in the three types of cones differ in their sensitivity to photons of different wavelengths (see graph). 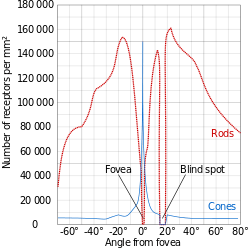 Since cones respond to both the wavelength and intensity of light, the cone's sensitivity to wavelength is measured in terms of its relative rate of response if the intensity of a stimulus is held fixed, while the wavelength is varied. From this, in turn, is inferred the absorbance. The graph normalizes the degree of absorbance on a hundred-point scale. For example, the S cone's relative response peaks around 420 nm (nanometers, a measure of wavelength). This tells us that an S cone is more likely to absorb a photon at 420 nm than at any other wavelength. If light of a different wavelength to which it is less sensitive, say 480 nm, is increased in brightness appropriately, however, it will produce exactly the same response in the S cone. So, the colors of the curves are misleading. Cones cannot detect color by themselves; rather, color vision requires comparison of the signal across different cone types. The process of phototransduction occurs in the retina. The retina has many layers of various cell types. The best-known photoreceptor cells (rods and cones) form the outermost layer, closest to the sclera, and furthest from the pupil. They are the photoreceptors responsible for sight. The middle layer contains bipolar cells, which collect neural signals from the rods and the cones and then transmit them to the innermost layer of the retina, where the neurons called retinal ganglion cells (RGCs), a small percentage of which are themselves photosensitive, organize the signals and send them to the brain. 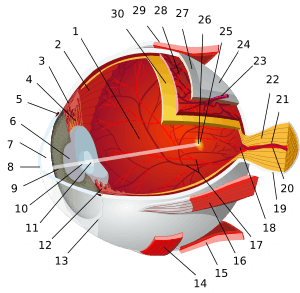 The bundled RGC axons form the optic nerve, which leaves the eye through a hole in the retina creating the blind spot. Activation of rods and cones is actually hyperpolarization; when they are not being stimulated, they depolarize and release glutamate continuously. In the dark, cells have a relatively high concentration of cyclic guanosine 3'-5' monophosphate (cGMP), which opens ion channels (largely sodium channels, though calcium can enter through these channels as well). The positive charges of the ions that enter the cell down its electrochemical gradient change the cell's membrane potential, cause depolarization, and lead to the release of the neurotransmitter glutamate. Glutamate can depolarize some neurons and hyperpolarize others. When light hits a photoreceptive pigment within the photoreceptor cell, the pigment changes shape. The pigment, called iodopsin or rhodopsin, consists of large proteins called opsin (situated in the plasma membrane), attached to a covalently bound prosthetic group: an organic molecule called retinal (a derivative of vitamin A). The retinal exists in the 11-cis-retinal form when in the dark, and stimulation by light causes its structure to change to all-trans-retinal. This structural change causes it to activate a regulatory protein called transducin, which leads to the activation of cGMP phosphodiesterase, which breaks cGMP down into 5'-GMP. Reduction in cGMP allows the ion channels to close, preventing the influx of positive ions, hyperpolarizing the cell, and stopping the release of neurotransmitters. The entire process by which light initiates a sensory response is called visual phototransduction. Unstimulated (in the dark), cyclic-nucleotide gated channels in the outer segment are open because cyclic GMP (cGMP) is bound to them. Hence, positively charged ions (namely sodium ions) enter the photoreceptor, depolarizing it to about −40 mV (resting potential in other nerve cells is usually −65 mV). This depolarizing current is often known as dark current. The rhodopsin or iodopsin in the disc membrane of the outer segment absorbs a photon, changing the configuration of a retinal Schiff base cofactor inside the protein from the cis-form to the trans-form, causing the retinal to change shape. This results in a series of unstable intermediates, the last of which binds stronger to a G protein in the membrane, called transducin, and activates it. This is the first amplification step – each photoactivated rhodopsin triggers activation of about 100 transducins. Each transducin then activates the enzyme cGMP-specific phosphodiesterase (PDE). PDE then catalyzes the hydrolysis of cGMP to 5' GMP. This is the second amplification step, where a single PDE hydrolyses about 1000 cGMP molecules. The net concentration of intracellular cGMP is reduced (due to its conversion to 5' GMP via PDE), resulting in the closure of cyclic nucleotide-gated Na+ ion channels located in the photoreceptor outer segment membrane. As a result, sodium ions can no longer enter the cell, and the photoreceptor outer segment membrane becomes hyperpolarized, due to the charge inside the membrane becoming more negative. This change in the cell's membrane potential causes voltage-gated calcium channels to close. This leads to a decrease in the influx of calcium ions into the cell and thus the intracellular calcium ion concentration falls. Reduction in the release of glutamate means one population of bipolar cells will be depolarized and a separate population of bipolar cells will be hyperpolarized, depending on the nature of receptors (ionotropic or metabotropic) in the postsynaptic terminal (see receptive field). Thus, a rod or cone photoreceptor actually releases less neurotransmitter when stimulated by light. Less neurotransmitter could either stimulate (depolarize) or inhibit (hyperpolarize) the bi-polar cell it synapses with, dependent on the nature of the receptor on the bipolar cell. This ability is integral to the center on/off mapping of visual units. ATP provided by the inner segment powers the sodium-potassium pump. This pump is necessary to reset the initial state of the outer segment by taking the sodium ions that are entering the cell and pumping them back out. Although photoreceptors are neurons, they do not conduct action potentials with the exception of the photosensitive ganglion cell – which are involved mainly in the regulation of circadian rhythms, melatonin, and pupil dilation. Phototransduction in rods and cones is unique in that the stimulus (in this case, light) actually reduces the cell's response or firing rate, which is unusual for a sensory system where the stimulus usually increases the cell's response or firing rate. However, this system offers several key advantages. First, the classic (rod or cone) photoreceptor is depolarized in the dark, which means many sodium ions are flowing into the cell. Thus, the random opening or closing of sodium channels will not affect the membrane potential of the cell; only the closing of a large number of channels, through absorption of a photon, will affect it and signal that light is in the visual field. Hence, the system is noiseless. Second, there is a lot of amplification in two stages of classic phototransduction: one pigment will activate many molecules of transducin, and one PDE will cleave many cGMPs. This amplification means that even the absorption of one photon will affect membrane potential and signal to the brain that light is in the visual field. This is the main feature that differentiates rod photoreceptors from cone photoreceptors. Rods are extremely sensitive and have the capacity of registering a single photon of light, unlike cones. On the other hand, cones are known to have very fast kinetics in terms of rate of amplification of phototransduction, unlike rods. Comparison of human rod and cone cells, from Eric Kandel et al. in Principles of Neural Science. Photoreceptors do not signal color; they only signal the presence of light in the visual field. A given photoreceptor responds to both the wavelength and intensity of a light source. For example, red light at a certain intensity can produce the same exact response in a photoreceptor as green light of a different intensity. Therefore, the response of a single photoreceptor is ambiguous when it comes to color. To determine color, the visual system compares responses across a population of photoreceptors (specifically, the three different cones with differing absorption spectra). To determine intensity, the visual system computes how many photoreceptors are responding. This is the mechanism that allows trichromatic color vision in humans and some other animals. The key events mediating rod versus S cone versus M cone differentiation are induced by several transcription factors, including RORbeta, OTX2, NRL, CRX, NR2E3 and TRbeta2. The S cone fate represents the default photoreceptor program, however differential transcriptional activity can bring about rod or M cone generation. L cones are present in primates, however there is not much known for their developmental program due to use of rodents in research. There are five steps to developing photoreceptors: proliferation of multi-potent retinal progenitor cells (RPCs); restriction of competence of RPCs; cell fate specification; photoreceptor gene expression; and lastly axonal growth, synapse formation and outer segment growth. Early Notch signaling maintains progenitor cycling. Photoreceptor precursors come about through inhibition of Notch signaling and increased activity of various factors including achaete-scute homologue 1. OTX2 activity commits cells to the photoreceptor fate. CRX further defines the photoreceptor specific panel of genes being expressed. NRL expression leads to the rod fate. NR2E3 further restricts cells to the rod fate by repressing cone genes. RORbeta is needed for both rod and cone development. TRbeta2 mediates the M cone fate. If any of the previously mentioned factors' functions are ablated, the default photoreceptor is a S cone. These events take place at different time periods for different species and include a complex pattern of activities that bring about a spectrum of phenotypes. If these regulatory networks are disrupted, retinitis pigmentosa, macular degeneration or other visual deficits may result. The rod and cone photoreceptors signal their absorption of photons via a decrease in the release of the neurotransmitter glutamate to bipolar cells at its axon terminal. Since the photoreceptor is depolarized in the dark, a high amount of glutamate is being released to bipolar cells in the dark. Absorption of a photon will hyperpolarize the photoreceptor and therefore result in the release of less glutamate at the presynaptic terminal to the bipolar cell. 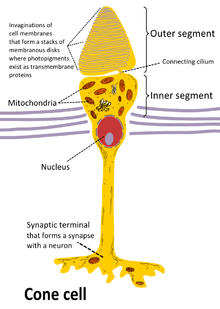 Every rod or cone photoreceptor releases the same neurotransmitter, glutamate. However, the effect of glutamate differs in the bipolar cells, depending upon the type of receptor imbedded in that cell's membrane. When glutamate binds to an ionotropic receptor, the bipolar cell will depolarize (and therefore will hyperpolarize with light as less glutamate is released). On the other hand, binding of glutamate to a metabotropic receptor results in a hyperpolarization, so this bipolar cell will depolarize to light as less glutamate is released. In essence, this property allows for one population of bipolar cells that gets excited by light and another population that gets inhibited by it, even though all photoreceptors show the same response to light. This complexity becomes both important and necessary for detecting color, contrast, edges, etc. Further complexity arises from the various interconnections among bipolar cells, horizontal cells, and amacrine cells in the retina. The final result is differing populations of ganglion cells in the retina, a sub-population of which is also intrinsically photosensitive, using the photopigment melanopsin. A non-rod non-cone photoreceptor in the eyes of mice, which was shown to mediate circadian rhythms, was discovered in 1991 by Foster et al. These neuronal cells, called intrinsically photosensitive retinal ganglion cells (ipRGC), are a small subset (~1–3%) of the retinal ganglion cells located in the inner retina, that is, in front of the rods and cones located in the outer retina. These light sensitive neurons contain a photopigment, melanopsin, which has an absorption peak of the light at a different wavelength (~480 nm) than rods and cones. Beside circadian / behavioral functions, ipRGCs have a role in initiating the pupillary light reflex. Dennis Dacey with colleagues showed in a species of Old World monkey that giant ganglion cells expressing melanopsin projected to the lateral geniculate nucleus (LGN). Previously only projections to the midbrain (pre-tectal nucleus) and hypothalamus (suprachiasmatic nucleus) had been shown. However a visual role for the receptor was still unsuspected and unproven. In 2007, Farhan H. Zaidi and colleagues published pioneering work using rodless coneless humans. Current Biology subsequently announced in their 2008 editorial, commentary and despatches to scientists and ophthalmologists, that the non-rod non-cone photoreceptor had been conclusively discovered in humans using landmark experiments on rodless coneless humans by Zaidi and colleagues As had been found in other mammals, the identity of the non-rod non-cone photoreceptor in humans was found to be a ganglion cell in the inner retina. The workers had tracked down patients with rare diseases wiping out classic rod and cone photoreceptor function but preserving ganglion cell function. Despite having no rods or cones the patients continued to exhibit circadian photoentrainment, circadian behavioural patterns, melanopsin suppression, and pupil reactions, with peak spectral sensitivities to environmental and experimental light matching that for the melanopsin photopigment. Their brains could also associate vision with light of this frequency. In humans the retinal ganglion cell photoreceptor contributes to conscious sight as well as to non-image-forming functions like circadian rhythms, behaviour and pupil reactions. Since these cells respond mostly to blue light, it has been suggested that they have a role in mesopic vision. Zaidi and colleagues' work with rodless coneless human subjects hence also opened the door into image-forming (visual) roles for the ganglion cell photoreceptor. It was discovered that there are parallel pathways for vision – one classic rod and cone-based pathway arising from the outer retina, and the other a rudimentary visual brightness detector pathway arising from the inner retina, which seems to be activated by light before the other. Classic photoreceptors also feed into the novel photoreceptor system, and colour constancy may be an important role as suggested by Foster. 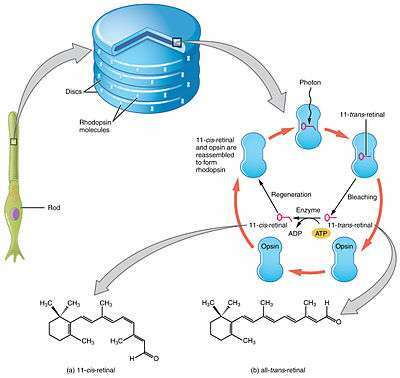 The receptor could be instrumental in understanding many diseases including major causes of blindness worldwide like glaucoma, a disease that affects ganglion cells, and the study of the receptor offered potential as a new avenue to explore in trying to find treatments for blindness. It is in these discoveries of the novel photoreceptor in humans and in the receptors role in vision, rather than its non-image-forming functions, where the receptor may have the greatest impact on society as a whole, though the impact of disturbed circadian rhythms is another area of relevance to clinical medicine. Most work suggests that the peak spectral sensitivity of the receptor is between 460 and 482 nm. Steven Lockley et al. in 2003 showed that 460 nm wavelengths of light suppress melatonin twice as much as longer 555 nm light. However, in more recent work by Farhan Zaidi et al., using rodless coneless humans, it was found that what consciously led to light perception was a very intense 481 nm stimulus; this means that the receptor, in visual terms, enables some rudimentary vision maximally for blue light. 1 2 Foster, R.G. ; Provencio, I.; Hudson, D.; Fiske, S.; Grip, W.; Menaker, M. (1991). "Circadian photoreception in the retinally degenerate mouse (rd/rd)". Journal of Comparative Physiology A. 169 (1): 39–50. doi:10.1007/BF00198171. PMID 1941717. ↑ Hecht, S.; Shlar, S.; Pirenne, M.H. (1942). "Energy, Quanta, and Vision". Journal of General Physiology. 25: 819–840. doi:10.1085/jgp.25.6.819. PMC 2142545 . PMID 19873316. ↑ Baylor, D.A. ; Lamb, T.D. ; Yau, K.W. (1979). "Responses of retinal rods to single photons". The Journal of Physiology. 288: 613–634. PMC 1281447 . PMID 112243. ↑ Richardson, T.M. (1969). "Cytoplasmic and ciliary connections between the inner and outer segments of mammalian visual receptors". Vision Research. 9: 727–731. doi:10.1016/0042-6989(69)90010-8. ↑ Bowmaker J.K. & Dartnall H.J.A. (1980). 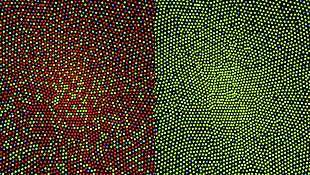 "Visual pigments of rods and cones in a human retina". J. Physiol. 298: 501–511. doi:10.1113/jphysiol.1980.sp013097. PMC 1279132 . PMID 7359434. 1 2 3 4 5 6 7 8 9 Schacter, Daniel L. (2011). Psychology Second Edition. 41 Madison Avenue, New York, NY 10010: Worth Publishers. pp. 136–137. ISBN 978-1-4292-3719-2. 1 2 Kandel, E. R.; Schwartz, J.H. ; Jessell, T.M. (2000). Principles of Neural Science (4th ed.). New York: McGraw-Hill. pp. 507–513. ISBN 0-8385-7701-6. ↑ Swaroop, Anand; Douglas Kim; Douglas Forrest (August 2010). "Transcriptional Regulation of Photoreceptor Development and Homeostasis in the Mammalian Retina". Nature Reviews Neuroscience. 11: 563–576. doi:10.1038/nrn2880. ↑ See retina for information on the retinal layer structure. ↑ Provencio, I.; et al. (2000-01-15). "A human opsin in the inner retina". The Journal of Neuroscience. 20 (2): 600–605. PMID 10632589. ↑ Hattar, S.; Liao, HW; Takao, M; Berson, DM; Yau, KW (2002). "Melanopsin-Containing Retinal Ganglion Cells: Architecture, Projections, and Intrinsic Photosensitivity". Science. 295 (5557): 1065–70. Bibcode:2002Sci...295.1065H. doi:10.1126/science.1069609. PMC 2885915 . PMID 11834834. 1 2 Vangelder, R (2008). "Non-Visual Photoreception: Sensing Light without Sight". Current Biology. 18 (1): R38. doi:10.1016/j.cub.2007.11.027. PMID 18177714. ↑ Lucas, Robert J.; Douglas, Ronald H.; Foster, Russell G. (2001). "Characterization of an ocular photopigment capable of driving pupillary constriction in mice.". Nature Neuroscience. 4 (6): 621–6. doi:10.1038/88443. PMID 11369943. 1 2 Genova, Cathleen, Blind humans lacking rods and cones retain normal responses to nonvisual effects of light. Cell Press, December 13, 2007. 1 2 Coghlan A. Blind people 'see' sunrise and sunset. New Scientist, 26 December 2007, issue 2635. 1 2 Medical News Today. Normal Responses To Non-visual Effects Of Light Retained By Blind Humans Lacking Rods And Cones. 14 December 2007. 1 2 3 Zaidi FH, et al. (2007). "Short-wavelength light sensitivity of circadian, pupillary, and visual awareness in humans lacking an outer retina.". Current Biology. 17 (24): 2122–8. doi:10.1016/j.cub.2007.11.034. PMC 2151130 . PMID 18082405. Campbell, Neil A. & Reece, Jane B. (2002). Biology. San Francisco: Benjamin Cummings. pp. 1064–1067. ISBN 0-8053-6624-5.